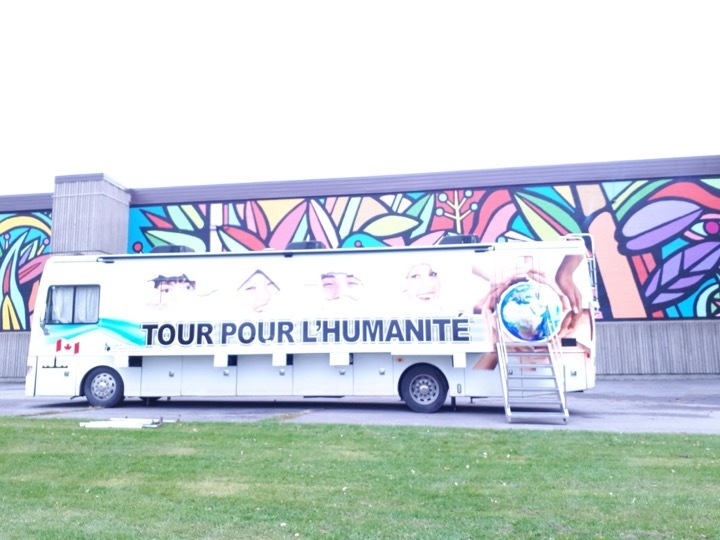 Today marks the Tour for Humanity's first day of workshops in Quebec! Friends of Simon Wiesenthal Center (FSWC) Educator Elena had a great day with a very supportive organizing staff member from the school in the English Montreal School Board (EMSB) that we visited. Elena taught three workshops today and will teach another four tomorrow, all Global Perspectives on Genocide. Today's workshops were all very successful. Elena talked about the significance of the Holocaust in the broader context of genocide studies and focused on the progression of hateful language and rhetoric into laws and finally outright violence during the Nazi regime. Most students had very little knowledge of other genocides that were discussed so Elena focused on Rwanda and Cambodia in addition to the idea of cultural genocide in the Canadian context. Elena had one long conversation in the second workshop of the day about the reasons why Jewish people were targeted during the Holocaust. Elena explained that antisemitism had existed in Europe for at least a thousand years and that the Russian Empire had been the site of countless pogroms against Jews in the late 19th-early 20th centuries. There were many troubling expressions of antisemitism before the Nazi regime, the majority of which took place outside of Germany. At the same time, the rise of violent nationalism and obsession with racial purity created an atmosphere of extreme hostility that laid the foundations of genocide..
Elena also took time at the end of each workshop to highlight the prevalence of hate-motivated violence among young people as a segue into our new video about hate graffiti. Elena distributed flyers about Speaker's Idol to each teacher who visited and showed the Speaker's Idol video as a great opportunity for students to research and learn to speak publicly on issues they are passionate about. The FSWC classroom was filled today with a group of Grade 7/8 students from an elementary school in Toronto - they joined FSWC Educator Emily to learn about leadership in our Leadership 101 program. The smaller class size today, around 22 students, gave more individuals opportunities to share and ask questions in our discussions. The students were incredibly insightful and Emily led a really good discussion about how to find the proper resources online and how to sort out misinformation, especially about the Holocaust. Students were well-versed in online misinformation. For the digital age, these sorts of conversations are so important in the fight against online hate and antisemitism. Emily also led a good conversation about intergenerational trauma as one of the teachers had heard about the issue in terms of residential schools, and wanted to know about the effects on the second-generation of Holocaust survivors. FSWC was also on the road today, visiting a private school in King City for a Holocaust workshop. The school’s drama department is preparing to put on Anne Frank, so the school wanted the students to have more background information. 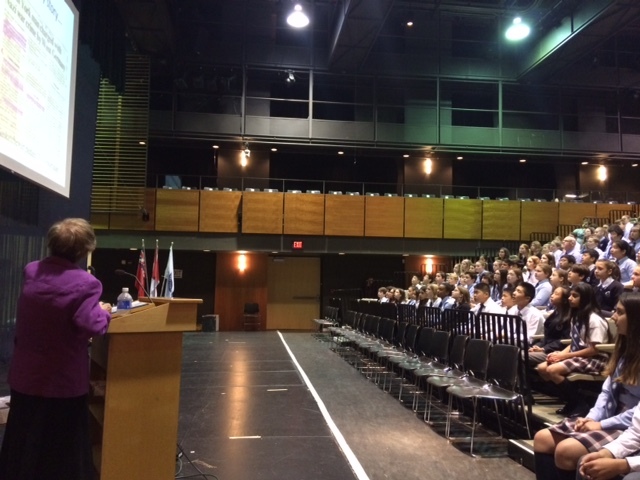 There were close to 140 students in attendance, ranging from Grade 7 to Grade 12. FSWC Educator Daniella began with an overview of the Holocaust, focusing a lot on Jewish people who spent the war years in hiding and how the experience impacted them. Daniella explained to the group that it was not uncommon for Jewish families to have left Germany in the 1930’s only to settle in a different European country (such as the Frank family who left and settled in Amsterdam, Holland). 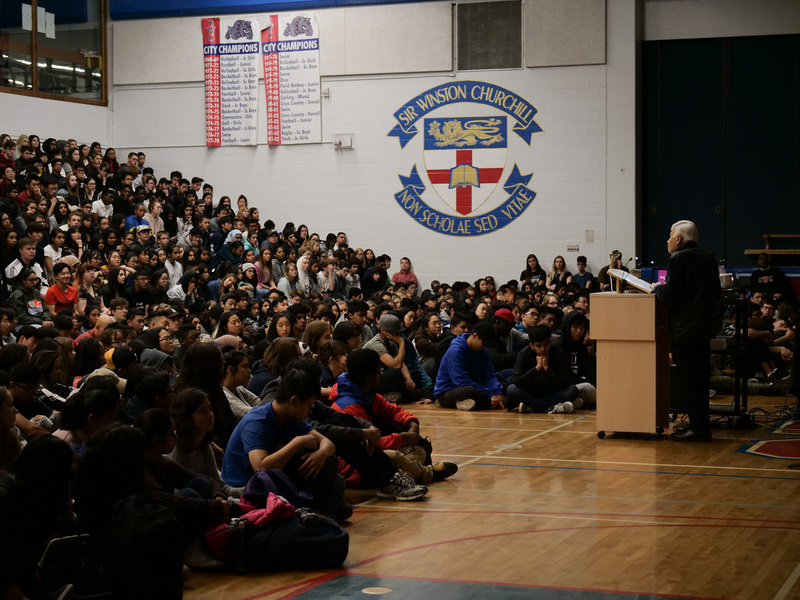 Following this, Holocaust survivor Faigie Libman spoke to the students about her experiences in the Kovno Ghetto and Stutthof Concentration Camp. It was evident that the students were very moved by everything they were hearing, there was no whispering or fidgeting and I even saw a few girls trying to hide tears. 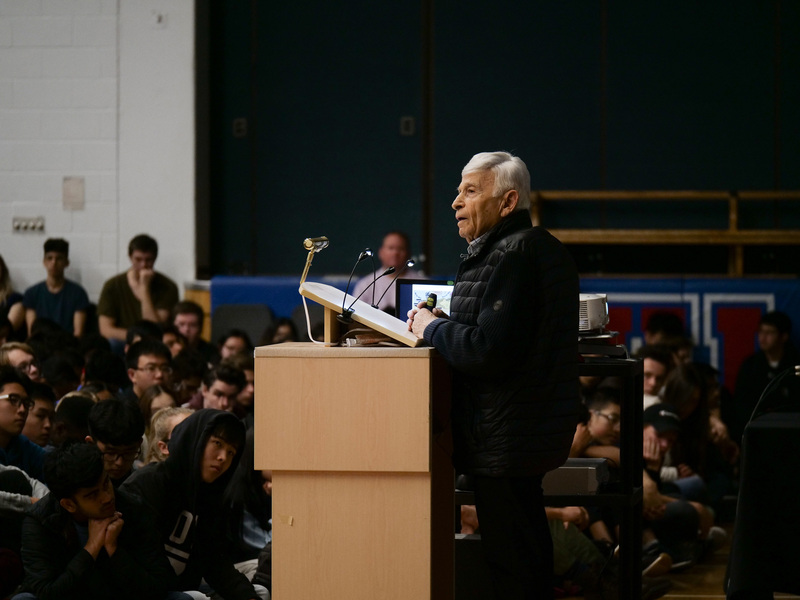 Finally, Holocaust survivor Max Eisen wrapped up his Alberta-tour with a presentation to hundreds of high school students at a public high school in Calgary. The impact of Max's testimony was seen in the numerous students to waited after the presentation to ask Max a question, to shake his hand or to simply say "thank you."